In our last blog, we began discussing tips that can help you get a full and restful night sleep. As a mattress store in Newington, we hear plenty of stories about the struggles that many have falling and staying asleep. We understand the frustration and for this reason offer quality affordable mattresses. To learn more about our stock and our current sales and promotions, visit our website! 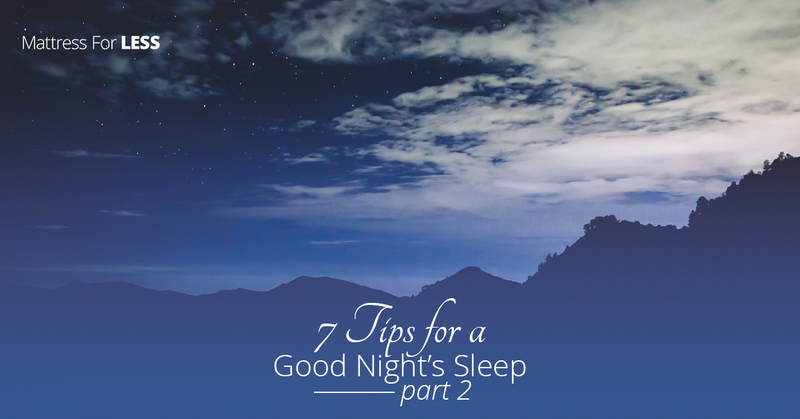 If you missed part one, we discussed three tips that can help you get a great night sleep. First, you need a consistent schedule: Waking up and falling asleep at regular times can help your body to begin to settle down for the night and to feel rested when you wake. Controlling the amount of light in your room is also a factor that can affect your sleep: eliminate all light from your room for the best sleep. Our third tip is to generally improve your bedroom’s environment by keeping it at a cool temperature and orienting your room for only sleep and intimacy with your partner. Read on to learn more about the factors that affect our sleep. Exercising during the day can be a key factor in helping you fall asleep at and wake up feeling rested the next day. Not only will your body be more ready to fall asleep because of the energy you expended, but your body will also crave the reparative nature of sleep. It seems that those who exercise during the day, are less prone to insomnia and sleep apnea and tend to have more deep restorative sleep. Though exercise does help you fall asleep, be sure to avoid exercising too soon before bedtime. The food we eat and the liquids we drink during the day can have a profound effect on the quality and amount of sleep we get during the day. Caffeine, nicotine, alcohol and sugary drinks are all culprits that can wreak havoc on our sleep. Alcohol, though thought to help you sleep, can actually rip out of a deep slumber due to your body processing the sugar of the alcohol later that night or early the next morning and caffeine can have lasting effects throughout the day. Also, simply drinking too many liquids before bed can also negatively affect our sleep due to the need to visit the bathroom multiple during the night. And if you are prone to stomach problems or heartburn, avoid big meals before bed. Additionally, winding down before bed is another important factor to consider when trying to improve the amount and quality of your sleep. Create space between your bedtime routine and the moment you turn out the light and hit the mattress for some much needed relaxation and downtime. Reading a book, meditating, taking a warm bath, making preparation for the next day, and deep breathing can all be things that can help clear your head of all the stress of the day so you can relax and fall asleep. Stay tuned for more posts about sleep, picking out the right mattress, and how to successfully get out of bed in the morning. Also, be sure to check out our website to learn more about Mattress for Less and the comfortable and affordable mattresses that we offer to Newington.